My birthday is August 21. That's coming up real soon! So I've decided to browse through my favourites on Etsy, and make up a list of things I'd like for my birthday. Of course, I only made it through about 5 of 45 pages, so I might have a few more lists coming up soon. Feel free to buy me any of these items... but don't buy them if you aren't going to send them to me! Especially the vintage things!!!! I've shown you my Marcrest Swiss Alpine plates that I bought recently... and I've marked ALL of the other listed china to match. Up above is a cake pan that is being sold by surrenderdorothy. 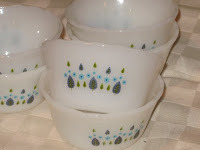 The mugs and saucers are being sold by thebuttercup and these adorable little fruit bowls are from ktrever. 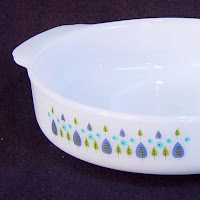 I just love this pattern for dishes! The colours are bright and cheery, and the little flowers are trees are SO cute! But please leave these for me. I sorely want them. Especially those cute little bowls. I love cute little bowls! Like this Nymolle dish, also from thebuttercup. 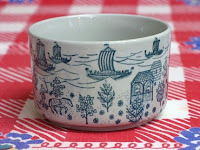 I love the sweet little Norwegian pattern. Alright, one more and I'll leave the dishes. I really do love dishes though. 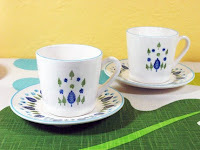 And this cup and saucer is to die for! Handmade by PamelaAngus, her shop is one you'll want to mark as favourite! 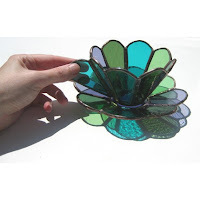 The stained glass makes for a really stunning piece ~ something you really wouldn't expect. And don't you think the colours go quite nicely with the Swiss Alpine set?? Let's move on to art. Do you remember one of my other obssessions? That's right, I couldn't make up a birthday wish list without including at least one bunny. 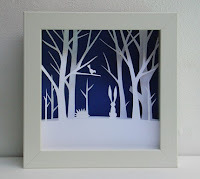 This gorgeous paper cut-out Forest Band art piece includes a cute little hedgehog and bird too. It's simply amazing! I still have a perfect spot on my wall for it too... Too bad it's a little (ok, a lot) out of my price range. But the intricate work of mollyjey is not one to miss! Textile are next on the list. And do I ever have some lovelies to show you. I'm going to mix up the colour scheme a little .. moving from blue/green to pink! This scarf leaves me breathless. The creator, azul, has some really amazing items! 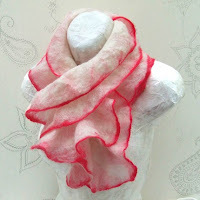 The Raspberry Ripple is a hand-felted scarf that looks as though it would feel like a cloud. The darker edges remind me of a pretty carnation. In another pretty pink, this dress just looks like it would fit into my wardrobe perfectly. A staple dress, it's perfect for everyday and easy to dress up in a flash. Made by Basicallyou, a shop that opened less than 2 weeks ago, this dress has already sold twice! I think that speaks for itself ! OK, so this purse isn't pink, but this violet is still exquisite. And the cute shape of the Grape Valkyrie purse is very versatile ~ easy to dress up or to just grab quickly on the go (money, lip gloss, pen and keys... and you're ready for class!). Morelle is a shop with some really great bags, but this shape is definitely my favourite one. Alright, last but not least. I was tempted not to include this pair of earrings because it is the only jewelry item in this list. I figured I could make my next birthday wish list exclusively jewelry items. But they're simply too gorgeous not to include them now. Plus I've already uploaded their picture. 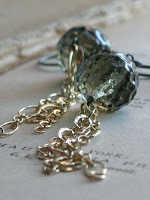 Aren't these stormy weather earrings beautiful? Leavesofglass has a lovely jewelry shop, but these earrings just scream at me to buy them. But I can't buy anything on this list, as much as I want to. Money is tight right now and I have a terrible shopping addiction. So I promised myself not to purchase anything else before my birthday. I've already failed, so I don't want to do anymore damage. Please buy everything here for me. I'll gladly give you my shipping address. Thank you! You've got great taste. I'd love to have any of those lovely items for my birthday too. Hope you get some.